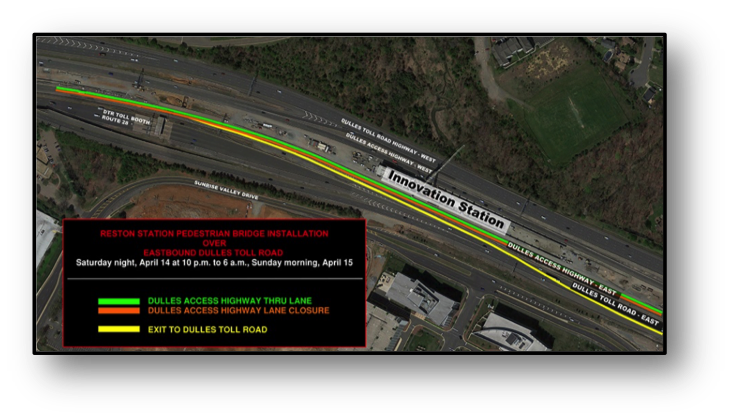 On or about Saturday, April 14, from 10 p.m. to Sunday morning, April 15 at 6 a.m., the last pedestrian bridge span for the Reston SilverLine Station will be installed over the eastbound Dulles Toll Road (DTR). The work will require a full closure of the eastbound DTR and lane closures on the eastbound Dulles International Airport Access Highway (DIAAH), between the Route 28 and Reston Parkway overpasses. See details and drawings and details of each night's closures below. Message boards and signing will be in place. All other traffic will remain on the eastbound DIAAH. At 10 p.m., the DIAAH will be reduced to one through lane from mile marker 1.6 to just east of the Reston Parkway overpass. Traffic lanes will gradually close until the just past the Centreville Road overpass where all DTR traffic will be diverted onto Exit 11. Detour signs will direct traffic to exit onto the Fairfax County Parkway south, to Sunrise Valley Drive east, to Reston Parkway north, and turn right back onto the eastbound Dulles Toll Road. Police will be on site during the closures. All work is weather dependent and subject to change. Figure 1: Dulles Access Highway traffic heading to Centreville Road, Fairfax County Parkway, or Reston Parkway will be directed to detour onto the eastbound DTR near mile marker 1.6. (The existing slip ramp at mile marker 2.7 from the eastbound DIAAH to the eastbound DTR will be closed.) At 10 p.m. the Dulles Access Highway will be reduced to one lane. Figure 2: All DTR traffic heading to Fairfax County Parkway, or Reston Parkway, will follow the detour signs and take the Fairfax County exit the DTR at the at Route 28 South, turn left onto Sunrise Valley Drive East, which intersects with Centreville Road, Fairfax County Parkway and Reston Parkway.